The racing spec muffler is a light weight and highly efficient muffler that is made to perform for circuit run. In its street version, to optimize torque in the low to mid speed range, it is equipped with an efficient middle silencer (resonator). 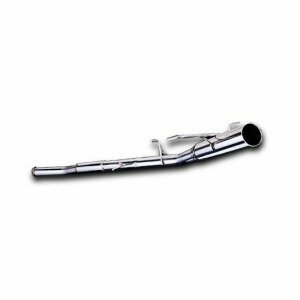 Racing Spec Muffler were designed for high performance as well as meeting sound level standards. With its deep throaty tone, it echo's it racing linage. Buddy Club Spec II is a specially designed system for competition use only. Its simple straight thru design creates an increase of exhaust gas velocity in order to improve efficiency. The middle silencer (resonator) on the main pipe is designed to maintain torque in the low to mid speed range. 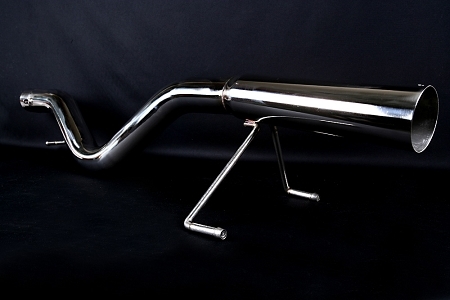 All mufflers are made with SUS304 stainless steel, 1mm is used for main pipe. and the ultra 0.8mm is used for main silencer. This combination creates a super light weight muffler. Durability can be seen throughout the construction of the system. The inner silencer is included with all systems.